Josaphat Kuncewicz, contemporary with St. Francis de Sales and St. Vincent de Paul, might have been taken for a Greek monk of the eleventh century, or an ascetic of the Thebaid. A stranger to the intellectual culture of the West, he knew only the liturgical books and sacred texts used in his own church; as a priest, an archimandrite, a reformer of his Order of St. Basil, and lastly as Archbishop, he combated all his life against the consequences of the schism of Photius, and closed the struggle by culling the palm of martyrdom. Yet all this took place in the heart of Europe, in the countries then subject to Catholic Poland, during the reign of the most pious of its kings. How is this mystery to be explained? Immediately after the Mongolian invasions, Poland received into her arms, rather than conquered, the Euthenian nation, that is to say the Slavs of the Greek rite from the Dnieper and the Dwina, who had formed around their capital and religious metropolis, Kiev, the nucleus of the power now known as Russia. Had she granted a participation in her own national life to these brethren separated from, but not enemies to, the Roman unity, who came to her full of confidence in her strength and her justice, Poland would have secured the triumph of the Catholic cause, and her own dominion throughout Slavonia. The union of the new-comers with the Roman Pontiff, which a little more political insight and religious zeal might have brought about in the fourteenth century, was not concluded until 1595. This was the union of Brzeso. By the compact signed in this little town of Lithuania, the metropolitan of Kiev and the other Greek bishops declared that they returned to the communion of the holy Apostolic See. Being the spiritual superiors of half the nation, they thus completed the union of the three peoples, TJuthenian, Lithuanian, and Polish, then subject to Sigismund III. Now, a religious reform, even if decreed by a council, does not become a reality until men of God, true apostles, and if need be martyrs, come forward to consummate it. This was the vocation of St. Josaphat, the apostle and martyr of the Union of Brzeso. What he did not himself carry out was completed by his disciples. A century of glory was secured to the nation, and its political ruin was delayed for two hundred years. But Poland left in a state of humiliating inferiority the clergy and people of the Grseeo-Slavonic rite, who had taken shelter in her bosom; her politicians never admitted practically that Christians of the Greek rite could be true Catholics, on an equality with their Latin brethren. Soon, however, the Latin Poles were engaged in deadly combat with the Muscovites, and we know how the former were vanquished. Historians lay down the causes of Poland’s defeat; but they usually forget the principal one, which rendered it irremediable, viz: the almost total destruction of the Union of Brzesc, the forced return to schism of the immense majority of the Piuthenians whom St. Josaphat had brought into the Catholio Church. The consummation of this execrable work contributed, far more than political circumstances or military triumphs, to establish Russia’s victory. Poland, reduced to nine or ten million Latins, could no longer struggle against her former rival now become her stern ruler. The power of the Slavs separated from Catholic unity is on the increase. Young nations, emancipated from the Mussulman yoke, have formed in the Balkan Peninsula. Fidelity to the Graeco-Slavonian rite, identified in their eyes with their nationality and with Christianity, was alone able to save these peoples from being stamped out by the Turkish forces. Victorious over the universal enemy, they cannot forget whence came their safety: the moral and religious direction of these resuscitated nations belongs accordingly to Russia. Profiting of these advantages with consummate skill and energy, she continues to develop her influence in the East. In Asia her progress is still more prodigious. The Czar, who at the end of the eighteenth century ruled over thirty million men, now governs one hundred and twenty-five millions; and by the normal increase of an exceptionally prolifio population, the Empire, within another half century, will reckon more than two hundred millions of subjects. Unhappily for Russia and for the Church, this power is guided at present by blind prejudice. Not only is Russia separated from Catholic unity, but political interest and the recollection of ancient strifes, convince her that her greatness depends upon the triumph of what she calls orthodoxy, which is simply the Photian schism. Yet the Roman Church, ever devoted and generous, opens wide her arms to welcome back her wandering daughter; forgetting the injuries she has received, she asks but to be greeted with the name of mother. Let this word be uttered, and a whole sad past will be effaced. Is there any foundation for such hopes? 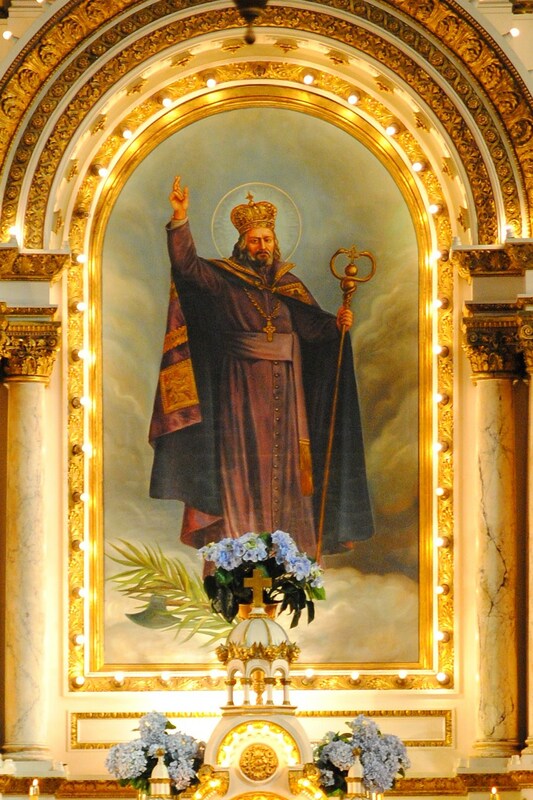 Come what may, St. Josaphat will always be the patron and model of future apostles of the Union in Russia, and in the whole Graeo-Slavonic world. By his birth, education, and studies, by the bent of his piety and all his habits of life, he resembled far more the Russian monks of the present day, than the Latin prelates of his own time. He always desired the ancient Liturgy of his Church to be preserved entire; and even to his last breath he carried it out lovingly, without the least alteration or diminution, just as the first apostles of the Christian faith had brought it from Constantinople to Kiev. May prejudices born of ignorance be obliterated; and then, despised though his name now is in Russia, St. Josaphat will no sooner be known, than he will be loved and invoked by the Russians themselves. Our Graeco-Slavonian brethren cannot much longer turn a deaf ear to the invitations of the Sovereign Pontiff. Let us hope, then, that the day will come, and that before very long, when the wall of separation will crumble away for ever, and the same hymn of thanksgiving will echo at once under the domeof St. Peter’s and the cupolas of Kiev and of St. Petersburg. We cannot presume to add anything to these authoritative words; the details will be filled up by the liturgical Legend. Josaphat Kuncewicz was born of noble Catholic parents at Vladimir in Volhyuia. When a child, as he was listening to his mother telling him about the Passion of Christ, a dart issued from the image of Jesus crucified and wounded him in the heart. Set on fire with the love of God, he began to devote himself with such zeal to prayer and other works of piety, that he was the admiration and the model of his older companions. At the age of twenty he became a monk under the Rule of St. Basil, and made wonderful progress in evangelical perfection. He went barefoot even in the severe winter of that country; he never ate meat, drank wine only when obliged by obedience, and wore a rough hair-shirt until his death. The flower of his chastity, which he had vowed in early youth to the Virgin Mother of God, he preserved unspotted. He soon became so renowned for virtue and learning, that in spite of his youth he was made superior of the monastery of Byten; soon afterwards he became archimandrite of Vilna; and lastly, much against his will, but to the great joy of Catholics, he was chosen Archbishop of Polock. In this dignity he relaxed nothing of his former manner of life; and had nothing so much at heart as the divine service and the salvation of the sheep entrusted to him. He energetically defended Catholic faith and unity, and isboured to the utmost of his power to bring back schismatics and heretics to communion with the See of blessed Peter. The Sovereign Pontiff and the plenitude of his power he never ceased to defend, both by preaching, and by writings full of piety and learning, against the most ahameleas calumnies and er rora of the wicked. He vindicated episcopal rights, and restored eccleaiastical possessions which had been seized by laymen. Incredible was the number of heretics he won back to the bosom of Mother Church; and the words of the Popes bear witness how greatly he promoted the union of the Greek and Latin churches. His revenues were entirely expended in restoring the beauty of God’s house, in building dwellings for consecrated virgins, and in other pious works. So bountiful was he to the poor, that, on one occasion having nothing wherewith to supply the needs of a certain widow, he ordered his Omophorion or episcopal pallium to be pawned. The great progress made by the Catholic faith so stirred up the hatred of wicked men against the soldier of Christ, that they determined to put him to death. He knew what was threatening him; and foretold it when preaching to the people. As he was making his pastoral visitation at Vitebsk, the murderers broke into his house, striking and wounding all whom they found. Josaphat meekly went to meet them, and accosted them kindly, saying: My little children, why do you strike my servants? If you have any complaint against me, here I am. Hereupon they rushed on him, overwhelmed him with blows, pierced him with their spears, and at length despatched him with an axe and threw his body into the river. This took place on the twelfth of November 16:23, in the forty-third year of his age. His body surrounded with a miraculous light was rescued from the waters. The martyr’s blood won a blessing first of all for his murderers; for, being condemned to death, they nearly all abjured their schism and repented of their crime. As the death of this great bishop was followed by many miracles, Pope Urban VIIL granted him the honours of beatification. On the third of the Calends of July, 1867, when celebrating the oenten. Thus prays our Mother today; and the Gospel likewise points to her desire of obtaining pastors like to thee, o holy Bishop! The sacred text speaks of the false shepherd, who flees at first sight of the wolf; but the Homily, which explains it in the Night Office, brands equally with the title of hireling the keeper who, though he does not flee, suffers the enemy unresisted to work havoc in the fold. May the divine Shepherd, whom thou didst imitate unto the end, even unto laying down thy life for the sheep, live again in all those whom he calls, like Peter, to exercise a greater love. Apostle of unity, second the designs of the Sovereign Pontiff, calling back his scattered sheep to the one fold. The Guardian Angels of the Slavonic race applauded thy combats: thy blood ought to produce other heroes; the graces won by the shedding of that blood still uphold the admirable population of the humble and the poor of Ruthenia, in resisting the all-powerful schism; while, on the confines of that land of martyrs, hope springs up anew with the revival of the great Basilian Order, of which thou wast the glory. May these graces overflow upon the children of the persecutors; may the present state of peace be the prelude to a full development of the light, and lead them back, in their turn, to that Rome which holds for them the promises both of time and of eternity.